One of my readers posted an interesting image of the "new" RS-24, tested in May, and Topol-M side by side. Although the original image, posted by Alexander, seems to suggest that the missiles are different, once you adjust the scale to make sure that both missiles have the same diameter (otherwise RS-24 could not have used the same launch canister), alll pieces fall into place - it is the same missile. My version of the image is on the left. 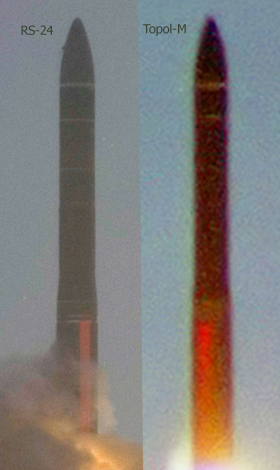 The images, of course, are quite grainy, especially the one of Topol-M (made during a test launch in 2002), so this cannot be considered a definitive proof. However, it certainly reinforces the case for RS-24 being MIRVed version of Topol-M. I don't know Russian but I think that in this video they said that one half of RS-24 missile is new, and other half is same like topol-m. The video is available on YouTube. Yes, Solomonov says that "half missile is new", but he probably means that it has new warhead section, guidance system, etc. The missile itself seems to be the same. Interesting. That'd imply that the new system was designated RS-24 in order to circumvent START treaty restrictions regarding MIRVing existing single-warhead weapon systems like the Topol-M.